Every good plan needs a solid foundation to build from. When it comes to visual merchandising in a retail store, that foundation is both metaphorical – an exciting and effective way of showing off products – and literal, with display fixtures such as tables, carts and shelf units providing a physical base for these efforts. Retailers can use these items alone or in concert to attract customers and show off many different types of products for a variety of reasons, whether a sale, a new, featured item or a lifestyle display. Display tables: There's a viable display table option for every type of retailer. These range from simple, natural wood fixtures to metal tables, multi-tiered display pieces and mobile carts. The wide selection makes it easy for business owners and decision-makers to find the find the fixture with a perfect fit for their store's overall theme and to match or complement existing fixtures. The mobile but sturdy nature of many tables means they can be moved across the available floor space to highlight different areas of a store and to help guide customers through it. Mobile carts: As the name suggests, mobile carts are even more easily moved than display tables and shelving units. Carts often take a more stylized appearance, but there are still plenty of different options and designs available to match the needs of individual retailers. One specific benefit of carts is the ability to very easily move and relocate these fixtures without much disruption to the products on display. Retailers in enclosed environments can use carts to easily display products outside their stores, and even those situated in a single storefront can roll out a merchandise cart when the weather is cooperative. Shelves: There are plenty of traditional shelving options available to businesses, and these may prove to be a good fit for many businesses. There are also more modern shelf structures that can fit into a variety of different areas and provide a unique, visually interesting display method. Rolling metal racks and glass display cubes are just two of the many different options available. Retailers can easily find the shelving and display units that are the right fits for their stores and begin using them. 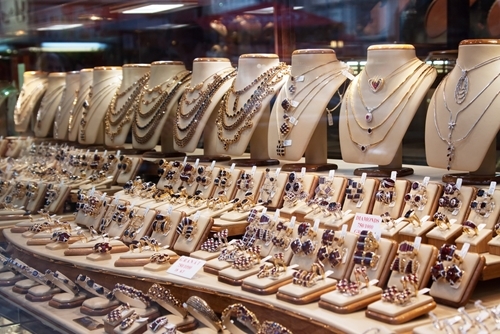 Is your store making the most of jewelry and accessory inventory?